Los Angeles – In a continuing creative partnership, Vans and iconic rock band Metallica proudly introduce a four-piece signature collection designed by each band member delivering to stores in February. Each Metallica member – James Hetfield, Lars Ulrich, Kirk Hammett and Robert Trujillo – had free reign to choose any iconic Vans shoe style and make it their own while drawing from their favorite influences in the worlds of music, action sports and art to create Vans shoes reflecting their personal style. Each shoe release is accompanied by a video capturing the unique shared passions between Kirk, James, Robert and Lars and favorite Vans team riders. The first edition highlights the “Trujillo Trio,” the result of Robert’s introduction to Vans’ skater Tony Trujillo and the musical mayhem that follows. 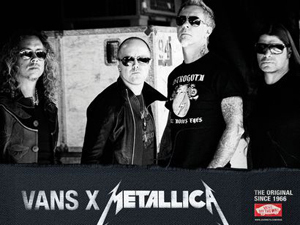 Stay tuned to vans.com/metallica and metallica.com for more details on the signatures shoes and for each new video drop. In March, Vans and Metallica introduce Kill ’Em All theme shoes featuring two of Vans’ all-time favorite styles, the Classic Slip-On and the Sk8-Hi, each emblazoned with artwork marking the 30 years since the release of Metallica’s debut album. Formed in 1981 by drummer Lars Ulrich and guitarist and vocalist James Hetfield, Metallica (www.metallica.com) have become one of the most influential and commercially successful rock bands in history, having sold 110 million albums worldwide and playing to millions of fans the world over. They have scored almost a dozen multi-platinum albums, including 1991′s Metallica (commonly referred to as “The Black Album”), which is the best selling album in history of Soundscan, scanning almost 16 million albums in the United States alone, and nearly 30 million worldwide. In October 2008, their album, Death Magnetic, debuted at number one on the Billboard Top 200 Album Chart and in 27 additional countries around the world. Metallica have garnered numerous awards and accolades, including nine Grammy®Awards, two American Music Awards, and multiple MTV Video Music Awards. They were inducted into the Rock and Roll Hall of Fame in 2009. In December 2011, Metallica celebrated its 30th anniversary, performing four shows at the Fillmore Theatre in San Francisco, CA, exclusively for members of their fan club, the Metallica Club. In 2012, they announced the launch of Orion Music+More, an annual two-day festival curated and headlined by the band. This past summer, Metallica unveiled a brand new stage in Mexico City that featured iconic elements that spanned its 30-year career. They played eight shows to nearly 180,000 fans at the Sports Arena in Mexico City. Later that month the band performed four shows on the same stage in Canada, two in Edmonton and two in Vancouver, during which they shot their upcoming Nimród Antal directed 3D Feature Film. Vans supports original and creative music acts ranging from Band of Horses to Public Enemy to Turbonegro by bringing memorable shows to global audiences at the House of Vans roving music venue that echoes Vans’ Brooklyn-based cultural hub and to more than half a million fans each summer at the Vans Warped Tour, America’s longest-running music tour. Shoe and clothing collaborations with Pearl Jam, Iron Maiden, Iggy Pop, Descendents, KISS, Social Distortion, No Doubt, Slayer and Metallica are among the many coveted projects that suit an “Off The Wall” lifestyle for music fans everywhere. For more information on Vans, please visit www.vans.com/music.